This is the launch article for Tomorrow's Talent, a campaign addressing the drivers of change in Human Resources, Technology, Finance and Sales. 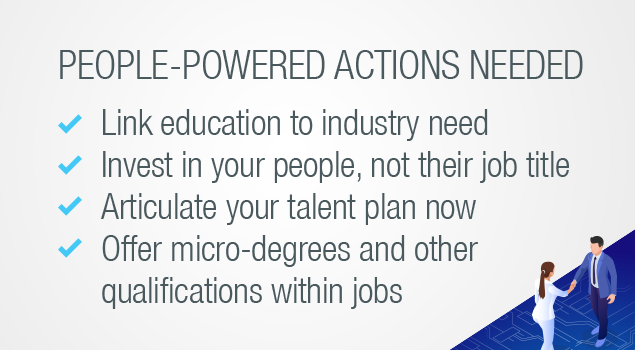 Anthony Thompson, Executive Board Director and Regional MD at Michael Page, argues that to fulfil their vast potential, APAC businesses must address some pressing issues on the talent landscape. One of the things I enjoy over a career path like mine is having a hunch confirmed about potential. One moment, you’re recommending a potential recruit to a company head. You’ll know the type of candidate: a long shot, high in potential but light on experience. Yet during the interview, there’s this special ingredient that you just can’t ignore. Cogs are turning behind the eyes, the attention is super-fixed. A range of small micro-movements are providing sure signs that your candidate realises what you too can see – that this role will fit them like a glove. In the recruitment game, signs of true engagement are like gold dust. And fortunately, you learn to spot potential early in the discussion. In this case, the bells are blaring. You push that bit harder, making the extra call to your client. ‘Sure’, you say over the phone. ‘I take your point. And we can certainly cast the net wider. But first, hear me out on this one.’ You explain that while still a little raw, you’re positive that this individual has everything required for the role and more – and that by making a calculated bet on talent potential, your client stands to gain someone who can really transform their business. Fast-forward to what seems like a blink of an eye, yet in is reality several years later. Your phone rings from that same company. And this time, your sure-bet recruit is the one calling you about a role – yet now she’s running the entire division. And yes, she is now in search of another gut-instinct call: another hot pick in tomorrow’s talent race. My little story isn’t a single example of one outstanding recruit – it’s a composite of a 20-year career, working for a company with double that pedigree. Yet this exact scenario has happened so many times to me and my team, that you do start to see patterns emerge: patterns that lend you deeper insights into the ‘high potentials’ of our talent world – who research suggests can deliver as much as 400% to 800% more impact to you than the average hire. Similar conversations to the one above are happening every day in PageGroup around Asia Pacific, in at least seven languages and dialects aside from English, lending us a base from which to share insights and knowledge into the way that our workplace is evolving. That’s what makes this particular campaign so exciting. I recently sat with our team to discuss Tomorrow’s Talent, our four-month content campaign designed to help us look at the changes transforming our business landscape around Asia Pacific – with a special focus on four of our most iconic disciplines: Human Resources, Technology, Sales and Finance. As an annual look at the future of work across Asia Pacific, we’ve chosen the word “tomorrow” deliberately – because change in this region is no longer happening decade by decade: now it’s almost month by month. When you travel regularly, you can’t help but be amazed by what the APAC region’s mix of progressive policies, new technologies and sustained peace and prosperity are doing to transform business landscape before our eyes. The future, as they say, has arrived. Powered by a youthful demographic wave as educated as any that we’ve created so far, the advances coming out of the Asia Pacific region are truly mind-blowing. Our nations are literally changing the map when it comes to new business and market potential: meaning that we live in very exciting times. And yet, we still read a growingly alarmist narrative in the media about the advances ahead of us – be it artificial intelligence (AI), robotics, automation, big data, block chain, driverless cars or space travel. According to this script, we face the prospect of these advances potentially catching up to, or perhaps even overtaking the need for human-powered work. Driven by worst-case scenario projections, I have to admit that these stories leave me particularly sceptical. One thing that experience and a lens on history delivers you is a sense of perspective. The fact is, we’ve experienced many waves of industrial and technological advancements in the past: and while these new advances are exciting, it’s important to remind ourselves that despite all that changes, many things stay the same. In fact, many of the aspects of our working lives won’t change, either now or in the future. In a service-driven environment like ours at PageGroup, we invest a great deal of time and energy into spotting potential and building talent. Whether this is talent for our clients, or for our own workforce of over 7,000 globally, we take the view that business now and in the future will continue to be people powered. And while tools such as revenue management systems, CRM or social media do make our lives as managers easier and more sustainable, they do so not to replace human tasks, but to allow us to improve them. Take my story above of our high-potential candidate. This one example highlights key elements of my team’s performance every day – elements which we now actively train in. Whether it is intuition, influencing, foresight, mindset or earned loyalty, these people-driven soft skills rely on time-intensive and personalised service. As we advance and scale our businesses, taking on greater complexity and moving across more locations, the ideal situation is to enable these person-to-person elements to improve – in many cases thanks to the brilliance of backend advances in planning, data mining, prediction and organisation. While notions of a world overtaken by machines might work in science fiction movies, they miss a key premise about business. Just as we have always done, we have to continue to run our companies by people and for them. Regardless of financial imperatives, any company that aims to bypass its community’s interests and our fundamentals of culture, ethics or morality, surely won’t be in business for too long. Another thing that futuristic scare stories risk doing is to distract us from the urgency ahead for our businesses. In the short- to medium-term, some sectors in our economies currently face the prospect of potentially crippling shortages of talent. It’s no exaggeration to say that in advanced economies, ready talent supply is becoming a global determinant for future growth potential. Globally, the recruiting, developing and retention of top talent remains the key priority for our Human Resources community. According to Mercer’s HR Talent Management Priorities 2018, the five top surveyed priorities for HR leaders this year are: Developing Leaders for succession (41%); Building skills across the workforce (40%); Attracting top talent externally (39%); Supporting employees’ career growth (38%); and Identifying high potentials (36%). The talent race is well under way. 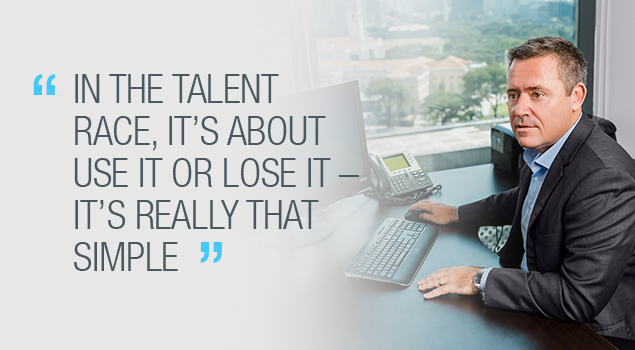 In Singapore, an economy facing inherent 30% talent shortages, this is particularly apparent. Throughout APAC, the urgency is no less clear. Unless we as a business community collectively address skilled talent supply issues – and unless we address shortfalls in training, alignment and work engagement along the way – then many exciting advances on the horizon could be derailed. Win the talent race, and just like my client did, you could see your business landscape unfold before your eyes. Ignore it, and you face the prospect of your best and brightest in Asia Pacific being tempted away to other organisations or growth regions: ones where they have made the supply of highly-trained, market-ready talent the strategic priority that it should be. In the talent race, it’s about use it or lose it – it’s really that simple.